Dense water is formed at the surface in small, highly localized regions of the ocean in polar seas. Thus the abyssal circulation seems to be induced by local sources. But for every particle of water that sinks, one must return to the surface. Property distributions suggest that the return branch does not occur in one, or a few, geographical locations. It seems reasonable to suppose, therefore, that there is widespread compensating upwelling on the scale of the basin. Deep flow is sluggish with very long timescales. It will therefore be in geostrophic, hydrostatic and thermal wind balance.Here we illustrate some of the dynamical principles that underlie the thermohaline circulation of the ocean, driven by sinking of dense fluid formed by surface cooling at polar latitudes. We represent the sphericity of the Earth with a sloping false bottom. The sinking of water at polar latitudes is represented by a source of fluid at the top right-hand-corner of the tank. Observations of CFCÕs at a depth of 2km (contoured). 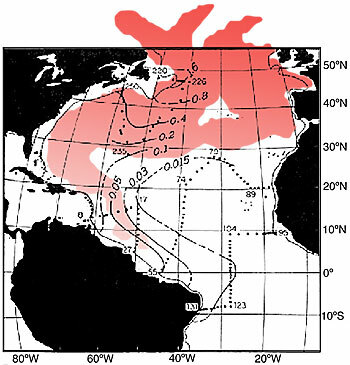 Superimposed in red is a snap-shot Ð for 1983 Ð of the CFC distribution at a depth of 2km in the North Atlantic as simulated by a numerical model of ocean circulation and tracer transport. The model results are courtesy of Mick Follows (MIT), the data courtesy of Ray Weiss (Scripps).